Hi everyone! One of my favorite people is having a birthday tomorrow. 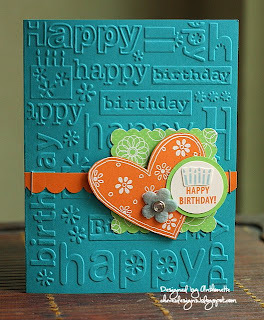 I made this card for her using Kristina's Color Inspiration Challenge #55. I loved the skirt, shoes, and feet of the inspiration photo. Kristina's boss has excellent taste! My little guy wants to play a game before dinner, so I'll make this quick. Have a good one and thanks for looking! 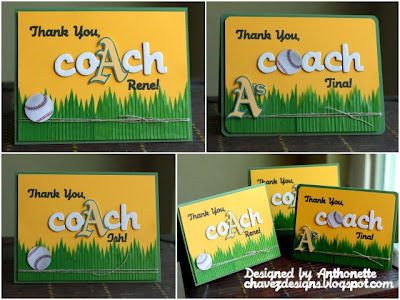 A good friend from our school's PTA asked me to make some thank you cards for her son's T-Ball coaches. The team is named after the Bay Area Oakland A's baseball team. These cards have some hybrid elements. I printed the Oakland's A's logo and trimmed out the "A". I found that SU! Summer Sun and Garden Green cardstock is a good match for the Oakland A's colors. 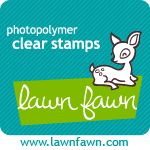 The grass is not cardstock; I bought it at the last rubber stamping convention I attended. The baseballs are stickers that I mounted onto chipboard. A few days before I found a great deal on white Thickers (Hat Box design) at Big Lots. Using this thread on Two Peas in a Bucket, I found that the Hat Box design of Thickers is a very close match to the Machine Script font. I printed the personalized text onto Summer Sun cardstock. Here are a couple of cards I made a few weeks ago for our school's auction. The second card (Spanish version) is going to my father-in-law. 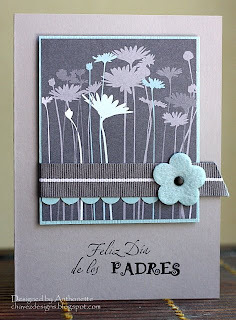 I don't have a stamp that says "Feliz Dia de los Padres," so I masked a stamp from the SU! 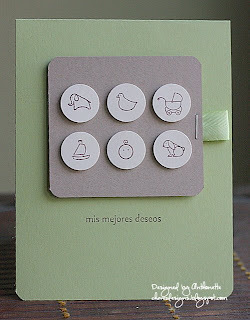 set Felicidades Siempre and added alphabet stamps to spell out "Padres." I'm not sure I like these as Father's Day cards, but oh, well! 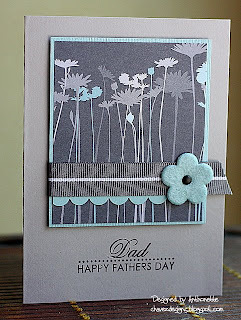 I couldn't resist using some Baja Breeze felt flowers on these cards. I love Felt Fusion flowers, but I forget to use them. The main image is designer paper. These were very easy cards to put together. 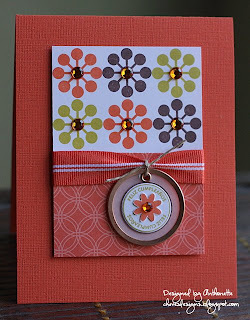 Here's a card for Dawn McVey's Raspberry Suite Color Challenge #9. 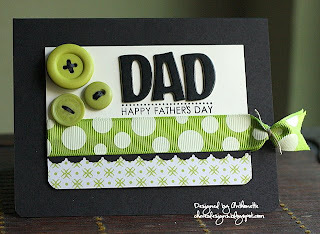 I've got to mail a Father's Day card to my sweet Dad by tomorrow to get it to him in time. I used Dawn's color combination (grass green, cream, & black) to help me out. It was hard finding items in my stash that had the specified green color and cream or black with cream. Most of my stuff had white mixed in, so luckily the Making Memories Chloe's Closet collection had the right green and cream colors! I used strips of black cardstock to thread the buttons (I've never done that); I like the effect. Thanks for looking and have a good one! (6.16.09) Edited to Add: Updated the photo; I was finally able to get the Taken with Teal to look correct. Whew! I made Kristina's deadline. 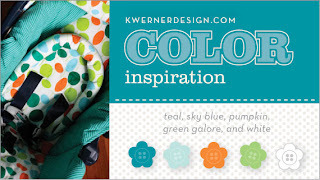 Here's a card for Kristina's Color Inspiration Challenge #54. I made this card for my niece, Elizabeth. It's a very late birthday card. I used a layout in the US-version of the Fall-Winter SU! catalog (p.133). Thank You Hero Arts & QuicKutz! Look what I won!!! Woohoo! I can't believe it. Yesterday I was telling you that it was both my husband's and my birthday. I won the grand prize from Hero Arts and QuicKutz! I got an email from Tami Hartley this morning. What a great birthday gift for both of us. He was looking at getting a digital cutter for his fun techie nerdy projects. That's right folks, he wanted a Silhouette too. The 3 of us are off to San Francisco this morning. We are going to RoboGames at Fort Mason. Happy Friday, my dear paper-crafting friends! Today is my birthday and my Sweetie's birthday. We share the same date (not the year, though). I use an uppercase on the "s" of Sweetie because that's one of the names I call him. I don't call him (or my son) by their actual names. I call them my other terms of endearment. Today is also Taylor's (Taylored Expressions) birthday. 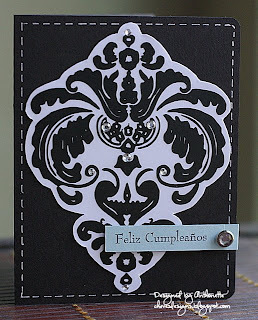 This card started with the Heidi Swapp damask sticker. Love these! I put it on white cardstock and then trimmed around the sticker. I added a few rhinestones and did not faux stitching around the edge. Voila! 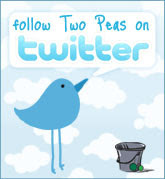 I may make my Sweetie a different card later if I have time, because he already saw this one. I made it for the school auction a few weeks ago. Hello! I'm posting some cards I made two weeks ago for the silent auction at school. 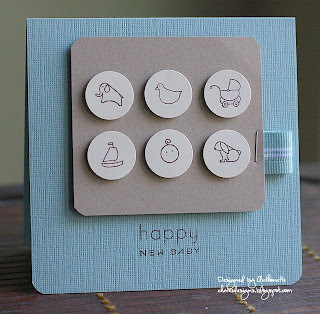 I loved the design of this card on Ashley's blog earlier this year and I knew I had to make some. Ashley's work is flawless. 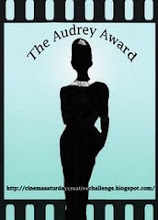 I loved the simplicity of her design and effectiveness of using tiny images. For the second card, I didn't have the exact equivalent sentiment in Spanish, so I used the phrase "mis mejores deseos" (best wishes). The only difference from Ashley's design is I used some ribbon and staples. Have a good creative day! Hi everyone! I've been super busy helping out at school, so I haven't had much crafting time. Kalino's last school day is June 11th. Here's a card I made over a week ago. 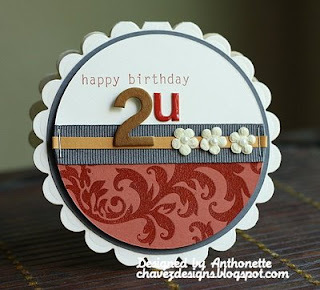 I used the 2nd card of this blog post by Carolina's Creative Pad as inspiration for my creation.